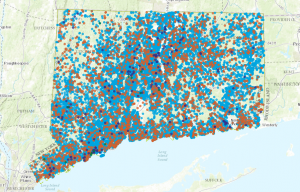 To show the impact the Connecticut Green Bank is having across all sectors in the state, we’ve added a visualization tool to our website. The tool shows the locations and details for all residential rooftop solar deployment, single – and multifamily loans, and commercial, industrial and infrastructure financing projects. The tool allows you to search by geographies, including county, city, utility service, political district, and census tract. To access the tool, please click here.